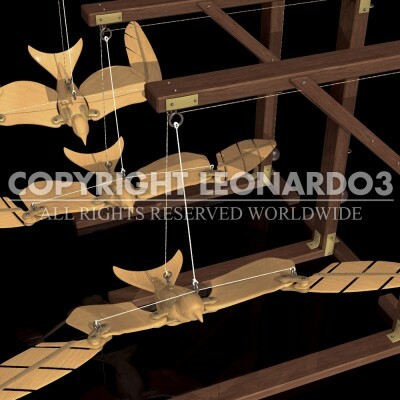 This is made in order to find the bird’s center of gravity; without this instrument, the constructed bird would be of little use. A dummy bird hangs from a wooden trestle, controlled by ropes connected to the wings and body. Such an experimental approach is not very different from that used today in wind tunnels, inside of which models are analyzed as they react to outside stimuli. 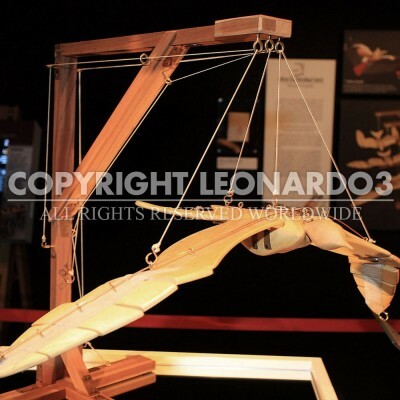 Leonardo moved immediately from experimentation to a description of facts and transcribed his results on this same page. He indicates two important points in a bird’s body: the center of gravity and the leading edge of its wings (the center of resistance). The relative positions of these two ideal lines involve a variation in the bird’s attitude.